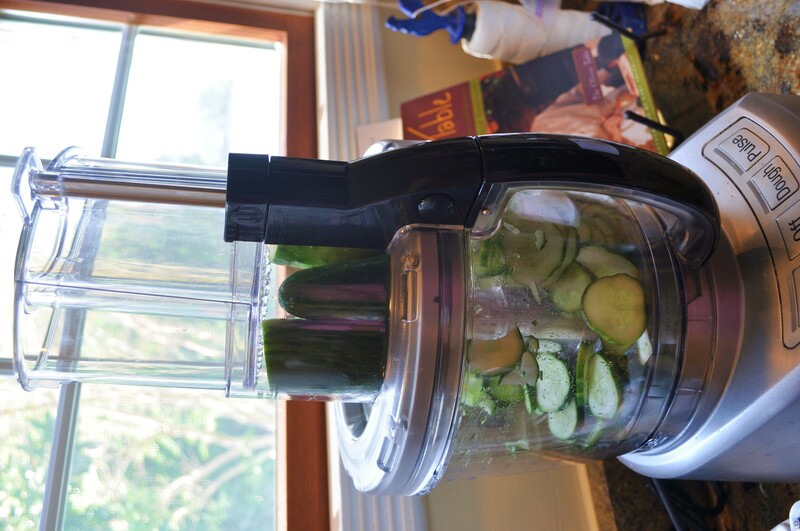 Refrigerator Pickles: Easy Bread and Butter Cucumbers and Okra | The Sassy Spoon: Fun Food! Easy, delicious and a perfect way to preserve some of the last of this summer’s produce, in this case some cucumbers and okra. Refrigerator pickles are great, crispier and fresher tasting than their canned cousins. This is a recipe that is both sweet and tart, much like Bread and Butter Pickles. Put them on your burgers, alongside sandwiches and use the okra in Bloody Marys. Add them to a cheese plate or charcuterie platter. 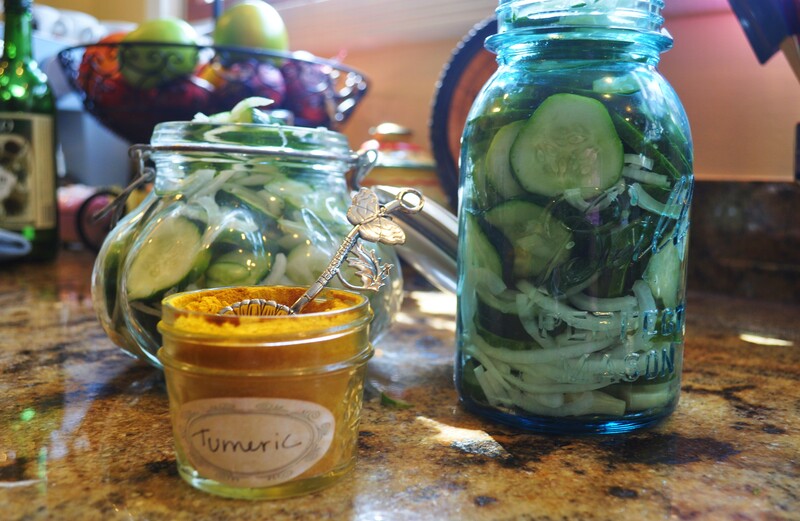 It is SO easy and you do not need a whole bushel of produce and lots of equipment to make these, just some clean jars, a knife (or food processor) and the ingredients. Here is the recipe to make 3 quart jars. It only takes about 30 minutes working time to do these. Well worth the effort. 4 cups okra ( I did the okra in one jar and the cukes in two others, but you could do more cukes if you are okra adverse). Pack the jars tightly. This can also be done in a plastic container. Cook all remaining ingredients to a boil and then simmer for four minutes. Allow to cool for 5 minutes. 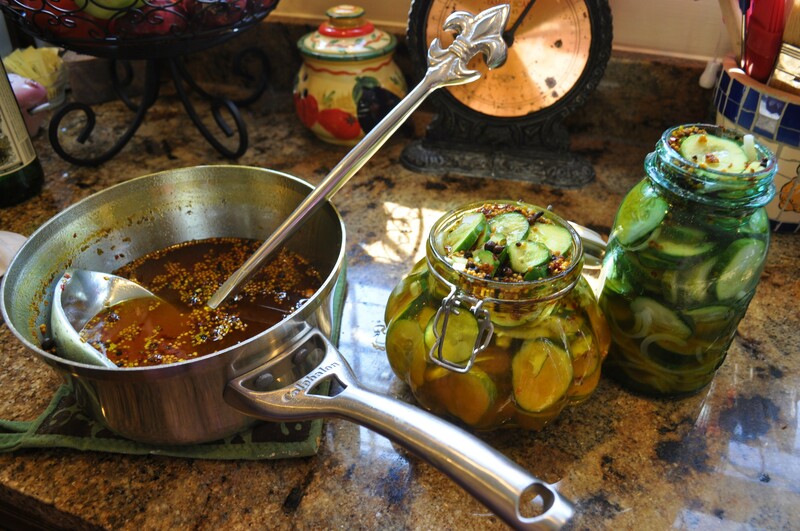 Pour the pickling liquid over the vegetables and close jars. Allow to cool completely, then place in refrigerator. 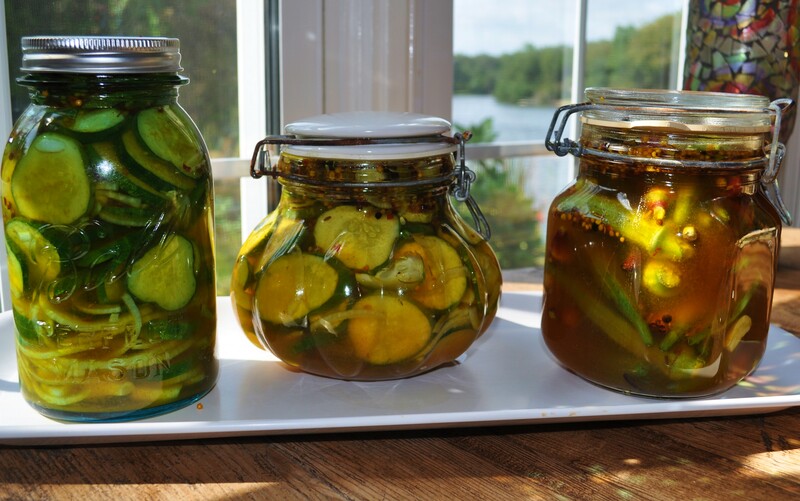 The pickles will be ready to eat in 24 hours. You can use a variety of vegetables to make pickles, peppers, carrots, jicama, sugar snap peas, asparagus, okra, even peaches. Our okra season in Massachusetts is EXTREMELY limited, but I could to the cukes. Thanks, Devany. I’m a pickle girl.